White Hart Lane railway station could be renamed Tottenham Hotspur as part of the regeneration project around the club's new stadium, reports claim. Transport for London (TfL) said it was "in discussions" with the club over the station rebrand which could cost the club more than £14.7m. The move mirrors legendary Arsenal manager Herbert Chapman's successful efforts to have Gillespie Road Tube station renamed in 1932. Tottenham Hotspur declined to comment. 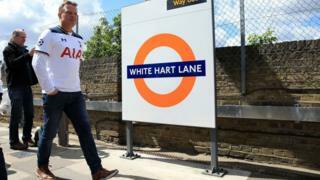 White Hart Lane, part of the London Overground network, is the nearest station to Tottenham's new stadium, which is set to officially open next month. The idea was first raised in October 2016 as part of a wider regeneration of the station's entrance, ticket hall, facilities and forecourt. The Guardian has reported a deal is close to being agreed with a memo of understanding between the club and TfL reportedly being drafted. Green party co-leader Siân Berry said: "We must be careful to protect the heritage of our transport system - temporary name changes to celebrate sporting heroes or public figures is one thing, but we should be vigilant against a sell-off to commercial and corporate interests. "The public have a right to their say on changes like this, and they should have been consulted." A City Hall spokesperson said:"The Mayor does not support setting a precedent of selling off station names. "However, a unique brand partnership between TfL and Tottenham Hotspur would benefit both TfL and Tottenham, supporting significant investment to create a new sport, leisure and entertainment destination as part of the wider regeneration of the area. " A TfL Spokesperson said: "Opportunities of this nature are always thoroughly evaluated before completion to ensure that TfL delivers best value for its stakeholders."